Is MCN a religious organization? Do you work with non-Muslims? The Muslim Community Network is inspired by the principles and values of Islam to seek justice and opportunity for all. Our programs are open to everyone, and we do not discriminate upon any basis. We seek to build the capacity of marginalized communities to access the rights, opportunities and resources they deserve. MCN does not offer religious training, but focuses on building the skills of our participants to engage fully in the economic, social and political life of American society. MCN is not a membership organization. Yes! The Muslim Community Network collects and distributes Zakat-compliant donations as per Islamic Law. MCN accepts zakat donations to support many of its projects. For more information and to make your Zakat-eligible donation to MCN, click here. 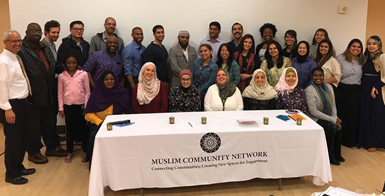 Since 2003, MCN has brought together the diverse Muslim Community of New York and initiated programs to strengthen understanding between the many faiths of the city. MCN’s long history with its Muslim and interfaith partners has led to its reputation for being an inclusive and trusted organization. We partner with an array of community and faith-based organizations to encourage the civic engagement of all New Yorkers, defend our collective civil rights, serve each others communities, and advocate for social justice. Here’s a list of our partners! There are many ways to get involved with Muslim Community Network and our programs. MCN offers many volunteer and internship opportunities for students and community members. Check out the Take Action! and News & Events sections of our website for additional information. What makes MCN different from other Muslim organizations? MCN is unique among Muslim civil society organizations in that our constituents and volunteers run the socio-economic gamut. We reach not only middle class professionals and university students, but also working class women and men. Our year long youth leadership training cultivates the next generation of leaders and inspires alumni to give back to their community through civic action and service. We are also unique in our focus on building strong partnerships, especially with other communities of faith, which can be leveraged towards actions of solidarity. Our programming is uncommon in that, rather than solely focusing on the immediate needs of the Muslim community, we structure our work to empower Muslims with the capacity to advance their communities’ long-term interests. We at MCN insist that our programs and organizational leadership are reflective of the communities we serve. We are one of the only organizations in New York City that brings together the diverse cultures and sects of the Muslim community to discuss their differences and work together towards achieving common goals.